Ideal for fertilizer or ag lime, the New Leader® L3020G4 features a 30 inch wide conveyor system, allowing operators to broadcast fertilizer from 75 lb per acre up to 3 tons per acre of ag lime while consistently achieving spread patterns with swath widths from 60 to 105 feet with fertilizer and up to 60 feet with ag lime. The heavy-duty #4 belt-over-chain conveyor effectively spreads materials and nearly eliminates bridging. An easy-to-access conveyor drive shaft and bearing make maintenance and tension adjustment simple. 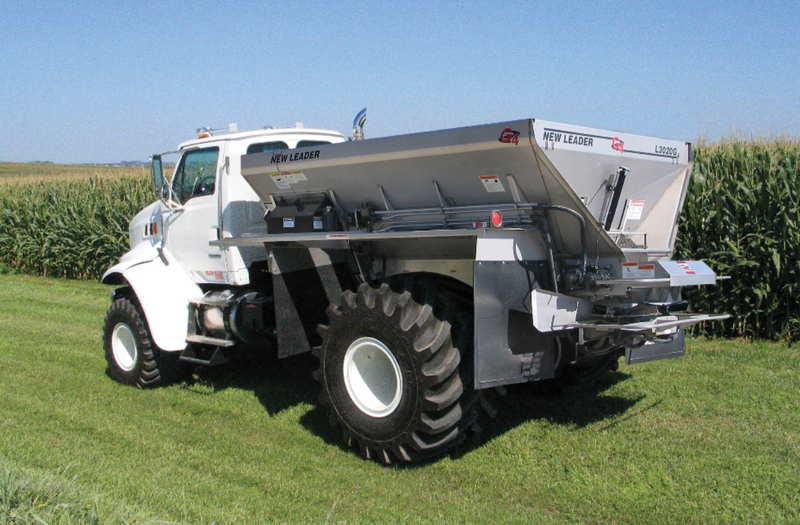 Available in 304 or painted 409 stainless steel construction, the L3020G4 is popular choice for operators that spread high volumes of lime using single axle trucks and want to minimize material bridging.